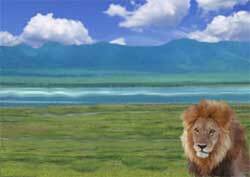 It is a haven for tens of thousands of big East African wild animals in north central Tanzania. Compared with the Serengeti and Masai Mara, the migration in the Ngorongoro Crater is scant. Reasons: It has an abundant year-round food and water supply - and the precipitous walls of this collapsed extinct volcano discourage (but don't totally eliminate) migrating. I noticed that the wild animals within the Ngorongoro Crater are less people shy to safari vehicles than those in the Serengeti. This makes it easier to view the animals up close. That helps explain why some seasoned safari goers believe that the Ngorongoro Crater is the most interesting wildlife preserve in the world. The encircling rim (shown in photo's background) is 600 meters (2,000 feet) above the crater floor. To appreciate its former size, consider that today's collapsed crater (technically a caldera) measures about 20 kilometers (12 miles) across.